Sometimes a dagger just isn't enough, but a full sword is way too much. And sometimes it seems impossible to get the water temperature just right in the shower. We can't really help you with the shower, but we've got just the thing to bridge the gap between decorative sword and decorative dagger. This gilded short sword is a beautifully decorated sword in the style of ceremonial masonic blades. 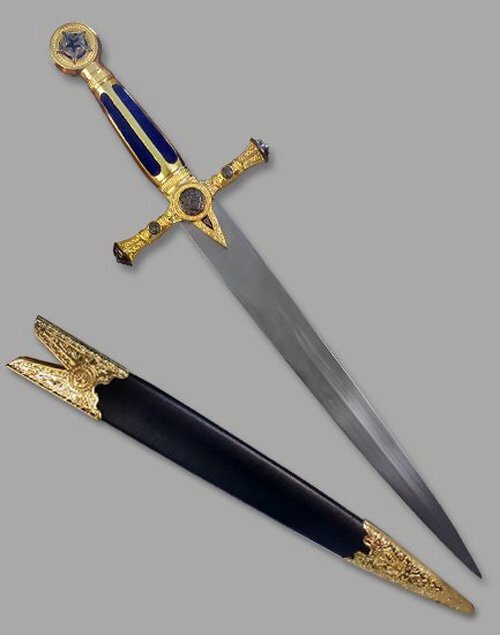 The sword is cast in a brilliantly ornate, golden metal (gilded is the term smart people use for this), with a red velvet grip, or a blue velvet grip designed by famed director David Lynch. Ok. That's not really true. David Lynch had nothing to do with this sword, but I bet we get a lot of his fans' search traffic now! 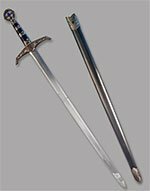 The sword is a handy 21 inches in overall length, which is a perfect middle-ground between an arming sword and a dagger. Not too heavy, not too long, but big enough to dazzle. The stainless steel blade is broad and flat, perfect for custom engraving (try out our decorative engraving designs on this blade--they look amazing). 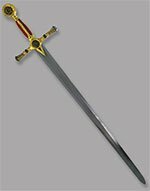 The Gilded Short Sword comes with a similarly gilded leather sheath, and both are decorated with Masonic symbols of God, Geometry, the Christian cross, and what looks like sword-wielding mermaids. Or possibly a Valkyrie being eaten by a large halibut. Who cares? 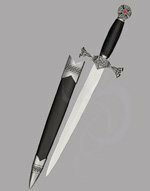 It's an absolutely gorgeous dagger, at an astoundingly low price. Get yours today and laugh at your poor friends who are stuck with an unwieldy sword or a puny dagger. Other Materials: Golden and antiqued cast metal. Available with red or blue velvet grip. Each blue velvet one comes with a lock of David Lynch's hair. (That's not actually true. We apologize for our writer's blatant pathological lies). This short sword includes a leather-wrapped scabbard with decorative throat and tip embellishments. It's a nice decorative sword, with a good engraving. Only some small details weren't as nicely finished as I would've liked. (casting-residu, not perfectly fitting sides of grip) After finishing those details myself, it was a suitable gift for the master of ceremony for my wedding. Good price/quality balance. Bought this from Strongblade because I wanted the engraving as a gift. Ordering the engraving was simple with lots of options. Sword was delivered ahead of schedule with regular shipping. Engraving looked very nice. Sword looks very nice (ceremonial gift, wasn't meant to be used) and has a very good heft and feel. Scabbard isn't quite as nice but better than I expected and still a very suitable gift. 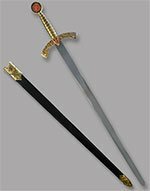 Overall and excellent choice as a gift for anyone who wants a solid real ceremonial sword. I'm unlikely to ever need another sword but this is where I'd go if I did, and certainly recommend the company based on my very limited expereince. The best company I've ever felt with as far as getting something done fast with clear understanding of the products you are ordering. Thank you Strongblade! I was extremely impressed with the quality of the engraving and the condition of the product. Not only that, but the delivery was so fast. All for a really good price. I couldn’t recommend this enough.